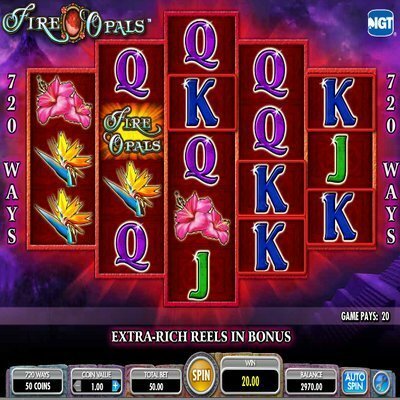 [miau] Fire Opals is a popular online and offline slot machine created by IGT. It has an interesting twist compared to the average slot game in that it has a unique reel layout. It features hexagonal reels with 720 ways to win. The 720 ways are active at every spin so no need to adjust the reels. You always have a shot at winning any way possible on this particular machine. A fifty coin wager is placed automatically on the outcome of each spin. No need to select how many lines with Fire Opals, just choose your wager and you are ready to play. All slot machines have a theme, whether it be sevens, popular characters, animals, basically anything goes. In Fire Opals it is based on fire and gems. The regular symbols include a volcano, fire princess and the bird of paradise. IGT almost always incorporates the king, queen and jack symbols into their slots as well. The hexagonal layout has a backdrop of clouds and a purple sky with mountains and other odd structures. The colorful, different design is sure to lure any gambler into this game. 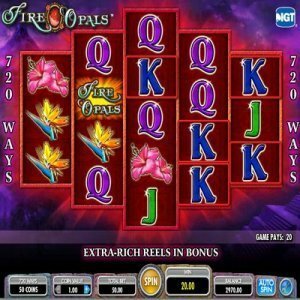 Fire Opals was the first IGT slot to incorporate the 720 ways to win both on and offline. The hexagonal shape means each reel has a different amount of rows. The first and last reel consists of three rows, the second and fourth consists of four and the middle reel is the highest with five rows. The object of the game is similar though to any standard slot machine. If you have three like symbols on a payline, you win. More than three, and the prize value increases. There are also special features within this game. The scatter symbol can be found anywhere on the screen and does not have to be in a payline to win. This is why it is called a scatter symbol, it can be scattered anywhere. The stacked wilds are a great feature of this game. They appear on the second, third and fourth reels and can make for a very lucrative spin. They substitute for all symbols except scattered symbols and the bonus. The Fire Opals bonus is triggered when you receive five blue or red Fire Opal logos. This will initiate the free spin feature. The player will start with ten free spins, but can accumulate more during the bonus round. In order to re-trigger the bonus one must hit five blue opals. 260 free spins are up for grabs and the stacked wilds are even more abundant during these rounds. The payouts are also higher during the bonus round so be on the lookout for the wild symbols and the blue opals. IGT made the bonus round more exciting, by making the colors even more vibrant on the reels. So sit back and enjoy the winnings. Like previously mentioned, Fire Opals is a slot machine one can enjoy at many casinos or in the comfort of your own home. It is important to note that online slot machines are not legal in certain countries. Be aware of the laws before playing with real money from home. Fire Opals is a fun, exciting slot machine. One any gambler would enjoy.